At the end of last year, Congress passed and President Obama signed the Elementary and Secondary Education Act, also known as the Every Student Succeeds Act (ESSA). The Act replaces the No Child Left Behind Act that has been in place since 2001. ESSA provides some $40 billion a year to support K-12 education in the United States and excitingly it includes new provisions that support students learning about the environment, conservation, and field studies. The basic idea that environmental literacy and conservation education should be included as a part of a well-rounded education for any student. More science, technology, engineering and math (STEM) education highlighting the desirability of field study and service learning both of which are solid environmental and conservation education approaches. This all came from a longstanding effort by the 2,000 member No Child Left Inside (NCLI) coalition, the North American Association for Environmental Education (NAAEE), the STEM Coalition, and others. Over many years, Project Learning Tree and our national network played an important role in this collective effort, including making visits to members of Congress, organizing teacher fly-ins, and arranging for members of Congress to visit schools and meet teachers in their home state. A big thank you to the many PLT State Coordinators, facilitators, and PLT teachers across the country who helped make these historic gains for environmental education! This is the first time a federal education bill recognizes environmental literacy programs as part of a child’s well-rounded education. Moreover, the new law makes environmental education eligible to compete for billions of dollars in federal grants to states. Stay tuned! We’ll be working with NAAEE to keep you in the know about funding opportunities for PLT in your state as details become available. Sign up for our free e-newsletter. 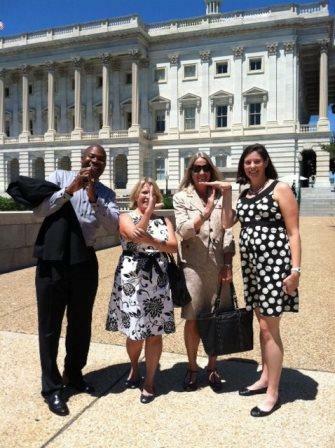 Photo: “Signing” PLT, teachers Shannon Lewis from South Carolina (second from left) and Margot Dickey from Virginia (right) join with PLT staff, Kathy McGlauflin (second from right) and James McGirt when visiting Members of Congress on Capitol Hill in July 2011.